For those of you who missed it, on January 10, 2012, Justine Greening, Britain's transportation secretary, announced what has been hailed as "the biggest leap forward in Britain's rail network since the 19th century." 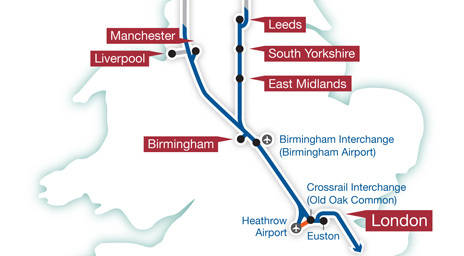 The 110-mile route between Birmingham and London will travel at speeds over 200mph and cut the travel time between the two cities by 49 minutes. Further, with the planned connection to the Chunnell, central England will have direct high-speed access to Paris. David Cameron, the conservative Prime Minister, passionately backed the investment despite some opposition from his own party (and his own father-in-law). The opposing members of Parliament generally criticize the project's costs. "The economic case has not been made," said Andrea Leadsom, a conservative MP and one of the project's strongest critics. Cameron, however, cites the new line's ability to rebalance the British economy, increase ridership capacity, spread growth throughout the country, and link cities. Others cite highway congestion, job creation, increased business opportunity, and the rail line's potential "transformative power" as reasons for support. The Birmingham Chamber of Commerce reported that 75% of its members believe the line will benefit their business. Funding will be a mix of private investment, European Union funding, and U.K. government funding. Read more from The Guardian, The Wall Street Journal, and Businessweek.